Andy Palmer: "Within the span of only two model cycles, this technology will be proven and will be spread across our portfolio." 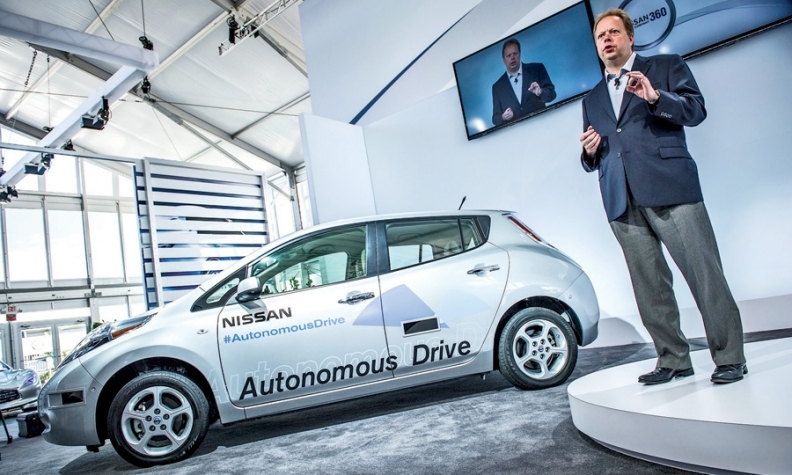 Nissan Motor Co.'s startling announcement last week that it will have self-driving cars ready for dealerships in 2020 thrusts the company into the forefront of an emerging and controversial new technology. And that's deja vu all over again. "We've been here before," agrees Andy Palmer, Nissan's executive vice president, who is responsible for future products globally. "We've moved ahead in new technology like this before." It was 2007 when Nissan CEO Carlos Ghosn stunned the industry by declaring he would get zero-emission battery-powered electric cars on the market by 2010. That put Nissan on a gutsy path when some automakers were still debating the viability of hybrids. And not just "an" electric car, Ghosn assured audiences at the time, but a line of dependable, practical, moderately priced electric cars of different styles and segments, in meaningful volumes, to sell in markets around the world. Now Nissan is breaking out of the pack again to pursue a new technological lead in autonomous vehicles. The ambitious language is strikingly similar to its campaign for EVs. "We're confident we can bring this technology to market," Palmer said last week on his way to dinner with journalists during a product review in Southern California. "You can see from our autonomous vehicle demonstration here that we are already well on our way to meeting the target. There are no tripods on the roof of the cars. It's a real car. "What we are saying is that within the span of only two model cycles, this technology will be proven and will be spread across our portfolio." It may be the auto industry equivalent of a moonshot. The term "autonomous vehicle," simply put, refers to a car or truck that would be capable of driving itself safely to a specified destination while its owners and passengers sit back and read their e-mails or enjoy the view. "We're talking hands-off, feet-off driving," the British executive clarifies. Other automakers around the world also are involved in research and development of autonomous vehicles. But others have shied away from pinning the futuristic concept to a brazen on-sale date. The steps they are taking are more incremental. This year, for instance, Mercedes-Benz and BMW were the first to offer "traffic jam assist" features that can take full control of steering, acceleration and braking at low speeds. Mercedes put such a feature in its redesigned 2014 S-class executive sedan; BMW put it in the redesigned 2014 X5 SUV and its new i3 electric car. General Motors is promising to go further than that by the end of the decade with "Super Cruise," an advanced version of cruise control that would not require a hand on the wheel or feet on the pedals. It would operate at any speed limit in the United States, GM engineers told Automotive News last week at the company's proving grounds in Milford, Mich.
Google Inc. has made waves with a prediction that the technology for a fully automated car, capable of taking a person from point A to point B, will be ready within five years. John Capp, who oversees the Super Cruise project at GM, said the company plans to go step by step, rather than straight to a fully autonomous car, for a fairly simple reason: "Driving is crazy." "Think about when you're driving, all the situations that come up," he told reporters. "Do you really think, inside of five years, that this system will be able to handle all of that? Really? I don't." But Nissan says it will do just that, pioneering "autonomous driving technology" as a combination of advanced sensing, steering, acceleration, safety, communications and data processing technologies being bundled into centrally controlled vehicle intelligence and added into its existing model line. Palmer sidestepped the question of how much Nissan will invest to develop it all and bundle it and put it into showrooms, saying it is a loose number. Some of the underlying technology already has been years in the making, he pointed out. And at least one of the key components -- electronic steering -- is already on the market in the new Infiniti Q50 sedan that was launched this summer. He said it would go into the "hundreds of millions of dollars." In comparison, the EV campaign required Nissan to create all-new electric models, such as the Nissan Leaf, and a new battery-propulsion system to power them. That initiative has cost Nissan about $5 billion so far. Much of the autonomous driving technology already exists, in pieces. But the obstacles this time are daunting. Visibility sensors need to improve enough to clearly discern what is in the road ahead. Existing back-up warning sensors, for example, often can't differentiate between the branch of a shrub and a brick wall. And vehicle processors need to be able to turn visual images into action instantaneously and without fail. To help move the science of vehicle sensing and processing forward, Nissan says it will construct a dedicated proving grounds in Japan. The construction project will include a mock city of life-sized buildings and real-life street conditions. That facility will be up and running next year, the company says. But the taller hurdles facing Nissan will be legislative and regulatory, says Alberto Broggi, a professor at Italy's University of Parma who has been involved in autonomous driving technology and research programs for the past 20 years. "The technology that will be required to enable Nissan to meet its target is moving rapidly forward," Broggi said by phone from Italy. "Seven years is a long time to perfect it. So they have time. "But on the legislative side, I really don't know. Those guys move forward very slowly." Broggi, who has conducted autonomous driving experiments around the world with European and U.S. vehicle makers, says safety regulators in various countries will have to sign off on new rules of the road before the first autonomous car can be sold. Even then, the first models sold probably will be confined to special highway lanes in selected areas. And getting to that point, he adds, probably will require highway officials to invest in advanced road improvements, with new road-to-car communications capabilities and emergency provisions. But then getting to the point where self-driving cars will be able to cruise along quiet country lanes, or to tool away in search of a parking space while owners enjoy a restaurant meal downtown? "That will take another 25 years," Broggi predicts. "This will occur in phases." "We will need to turn our attention to more lobbying efforts," Palmer says. "Some countries will move faster than others to be prepared for this. The United States is a very litigious society, so we will want to be very diligent in our development." Nissan's announcement was carefully worded to say that the company will have the technology "ready" for market in 2020 -- not that the cars will be approved and sitting in retail showrooms. Palmer waves away the fine verbal distinctions. "They will be ready, and I'm pretty sure that in 2020 we'll have them in dealerships in some countries in the world," he says. "Some governments will approve them by then. Our motivation here as a company is to reach the point of zero traffic fatalities, and this is our path to reach it. This is technology that can help save people's lives. I believe politicians will be very open to it." He adds that Nissan's target for autonomous vehicles is like its 2007 declaration for electric cars in one other significant way. When Nissan set out to enter the EV business, there were still unknowns, he recalls. "There were pieces of the plan that we hadn't worked out yet," he says. "We didn't know in the beginning how we would get charging stations installed everywhere." Those unknowns began to work themselves out when the recession came along unexpectedly and government entities entered into the financial picture, offering electric vehicle subsidies and shouldering some of the cost of building chargers, he points out. As the new program moves forward, he says confidently, today's questions also will be answered and things will work out again.